Story and photos by Peter Hey. 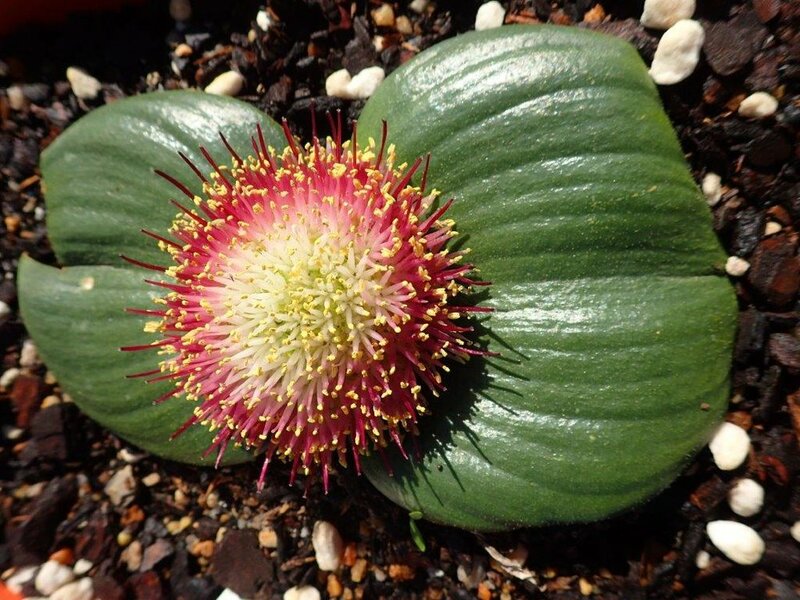 This interesting genus of hardy perennial bulbs hails from South Africa and is still thought as being rare in Australia. Massonia spp. are members of the family Hyacinthoides which also contains Veltheimia, Lachenalia and Daubenya spp. Many of which have stunning flowers or foliage. Massonias combine intriguing perfumes, hardiness, amazing adaptability and beautiful floral structures with stunning foliage. After a relatively short hibernation period during spring to mid-summer, Massonias commence emergence, almost in slow motion and generally with two leaves. They soon form a flower bud which can remain unopened for many weeks before giving us an evolving display of beautiful composite florets. The leaves vary from species to species, often with textured pustules or strikingly marked with red spots and blotches. M. longipes, for example, has pustules and other markings and displays eye-catching architectural symmetry in the foliage. Nature has provided some of these intriguing species with the ability to raise and lower themselves in the ground, most noticeable M. depressa brown form. Keeping their leaves firmly pressed to the soil also assists in water management. This season I will be growing them in small containers on indoor window sills. I can enjoy their perfume indoors and I am particularly keen to refresh my nostrils with the lovely scent from M. citrina, with its brilliant canary-yellow flowers that contrast against the deep green leaves. Being generally drought-tolerant, Massonias will thrive inside providing, of course, that they are not overwatered. One species, M. amoena having besides having a strong scent, has dark purple/black pollen, which contrasts against the pearly white florets that are flushed with soft pink. 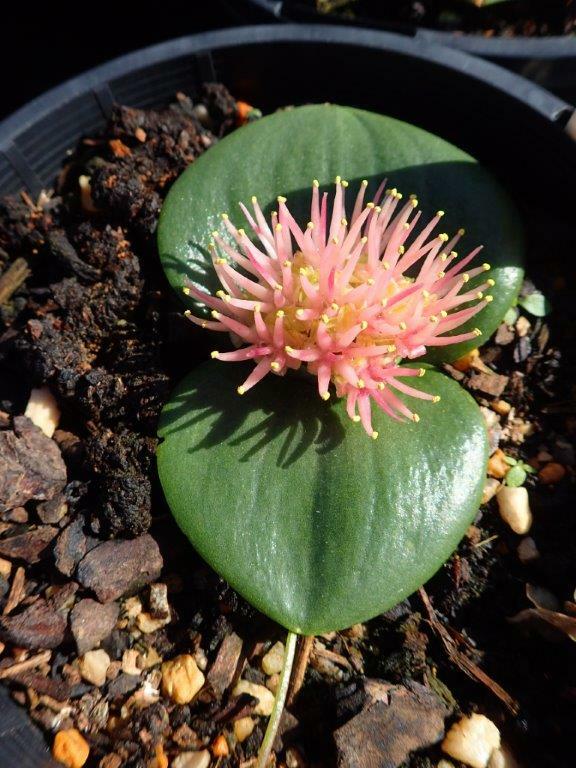 Another strongly perfumed Massonia is M. echinata which hails from the Napier region in South Africa. The genus Massonia is currently undergoing reassessment and it is suggested that there may be more than forty species in the new taxonomy, due to be completed in 2019. I am keen to expand my collection of Massonias and can confidently recommend these interesting and attractive specimens. Being still very unusual and rare, Massonias are generally not listed in growers catalogues, but they can be found at the collector’s and rare plant fairs. Peter Hey has been associated with the horticultural industry for over thirty-five years, specialising in researching rare and unusual plants. He is currently completing a fifteen year programme developing new hybrid Clivias, and now that many targeted Clivia hybrids are growing happily he has recently diversified his interests into Massonias and their related genera. Peter is researching various beneficial microflora combinations for Massonias in Eastern Australian growing conditions.